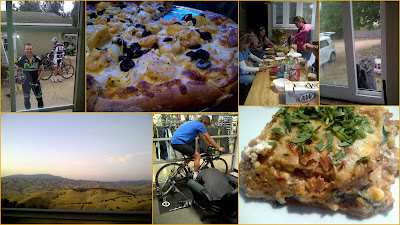 Early September we made a trip to San Luis Obispo for business and pleasure. Our time was short but we managed to get in as much family time with friends as we could. Carrie made a wonderful dinner one evening (a Mexican lasagna which was yum-yum), John went riding with his best friend, and we went out for one of the best pizza's I've had another night (I cannot recall the name but it was spelled funny is all I can remember). Occasionally their adopted cat, Smokey, would visit us and risk the wrath of the homeowners by climbing the window screen to peek at us (actually it's her way of asking for supper).